The SmartFin allows data to be gathered without having to consciously and physically collect the data. 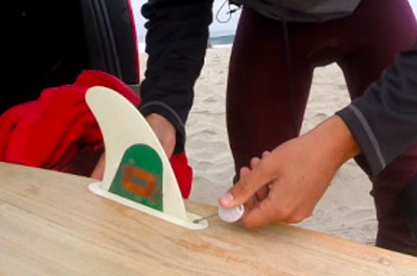 The SmartFin is simply a fin that attaches to the bottom of a surfboard, like any other fin, but the SmartFin is able to read the elements of the water such as temperature, salinity, pH, location, and wave energy. This information can help scientists further understand the changes of our local and global water system. I believe this technology also has further capabilities that have not been reached yet. Recreational water users; scientists; NGOs; government agencies. This technology is still being tested and explored. Create an app that is user-friendly and allows for a data-driven platform. Attempt to connect with stakeholders, such as surf conglomerates, in order to implement the technology for use by the citizen scientists. I wonder if consumers will need to buy a more expensive surfboard to begin using the smartfin which might cause the technology to have trouble being pushed out to the general surfing community. Also benefits of data collection of the ocean for the consumer him or herself is not determined. Thank you! This tech is very cool not to mention very useful considering the important and urgent need for oceanic data. Although being a key source of solutions and innovation, less than 5 percent of the world’s oceans have been explored according to the National Ocean Service. Surfers are key oceans’ stakeholders and who better than them can go collect data in places where nobody else goes? Last week, I presented LeafSnap, an app that uses facial recognition to provide people with information about their natural environment, sharing the plant localisation info with the scientific community simultaneously. This emmerging concept of citizen scientist driven by their own passion is liable to be an essential trigger for Smart Cities. Generally speaking, I think that data collection system that do not require additional efforts from citizen scientists have a brighter future. I also liked that the specific combination of skills of this surfer-scientist lead him to develop a unique smart tech using the Internet of Things concept. It reminds us of the importance of people/individuals in the journey to Smart Cities. Additional Info : Once it’s complete, Thompson says the plan is to sell the fins in stores, but open source the data so that other developers can build their own consumer apps on top of it.